This one just came into the collection. 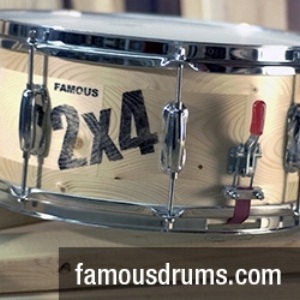 I purchased this snare drum and another snare drum from a seller who lives on the East Coast. This deal was not the most pleasant of deals and was not the typical drum deal that I am used to. On a positive note though, this encounter made me cherish even more the many pleasurable deals that I have had with my friends and fellow collectors over the years. There is no need to rant, name names or elaborate any further as this is not my intent when I write my articles. 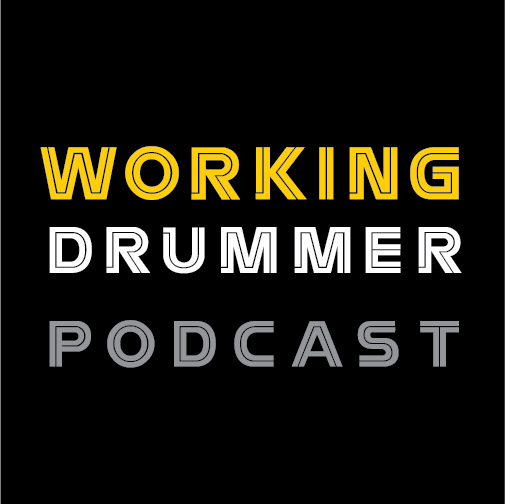 Let’s just leave it that sometimes a drum deal does not go as planned. 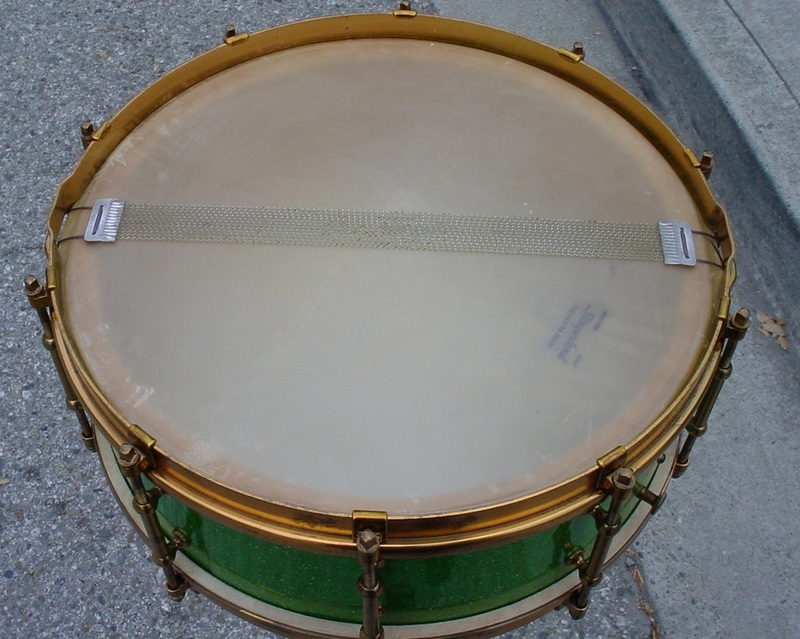 Slingerland’s Sparkling Green finish was first introduced around 1934. I have seen my share of Sparkling Green/Green Sparkle finishes from the 1930s and this drum shell is one of the cleanest versions that has ever come my way. “Cancer free”. The finish cleaned up and polished up nicely. The solid maple shell interior is very clean. The cloud badge is also clean with a tight grommet. The problem was with the nickel plated hardware. The seller emailed photos that looked fine but on further examination, with the drum in my hands, it was clear that the “carpet didn’t match the drapes”, as the saying goes. The photos that were emailed to me showed that the nickel plating looked like a normal 81 year old patina that I could have cleaned and polished but on further examination there were a number of areas where the nickel had been buffed or polished down to the brass. So the problem was that the hardware just didn’t match the very clean Sparkling Green finish. The seller said that that was how he received the drum and that he would not reverse the deal so I just moved on from there to make this a positive outcome. I decided to swap the hardware from a same-era Artgold walnut Artist Model that was in my restoration queue. I have seen this combination before and have actually restored the Artgold hardware on a Sparkling Green Artist Model that is owned by my good friend and noted UK collector Dave Brown. The Artgold hardware was all there and in very good shape so a basic cleaning and some minor polishing on a few parts was all that was needed. Yes, this drum was most likely not “born” with Artgold hardware and I really didn’t have to mention the swap-out but I thought that this would make a nice addition to my article. Slingerland top and bottom calf heads and James Snappi Wires rounded out this cleaning. Slingerland Artist Models are very rare as compared to Ludwig & Ludwig Standard Models of the same era. I have seen many more L & L Standard Models in existence than there are Slingerland Artist Models. In closing, I added a photo of my 1932-34 Slingerland 5 x 14 Sparkling Green DuAll Model and my 1935-36 Slingerland 6.5 x 14 Sparkling Green Broadscaster Model, both of these are also pretty clean .